In the first half of September 1952, close to the site of Kh. Qumran, Bedouin discovered three new caves bearing manuscript fragments. These became known as caves 4 (4a and 4b) and 6. Caves 4a and 4b were situated only seven meters apart from one another. Unfortunately, the Bedouin mixed the manuscripts coming from these two caves and, accordingly, de Vaux decided to record all fragments coming from both caves as “4Q”. The Bedouin offered some of the fragments for sale in Jerusalem on Sept. 20 before they had finished emptying the caves. The authorities quickly found the caves and stopped the digging. Within two days de Vaux and Harding arrived with a team to excavate the cave. Of the approximately 730 fragmentary manuscripts which have been identified as having come from cave 4, fragments of about one-fourth of these were identified among those found in the excavation dubbed “the ‘E’ series” (PAM 40.962-985). Also derived from excavation: an ink-inscribed jar (PAM 42.865). Fragments of various manuscripts excavated by the team include: 4Q1, 22, 24, 26, 27, 30, 34, 37, 51, 52, 62, 63, 68, 72, 74, 80, 84, 109, 111, 114, 115, 121, 163, 179, 204, 217, 227, 249, 257, 258, 270, 276, 289, 302, 321, 324c, 334, 364, 365, 367, 379, 381, 384, 387, 391, 395, 412, 418, 422, 423a, 432, 440, 481, 487, 489, 497, 499, 503, 506, 509, 512, 518, 519, 525, 529, 545, 558, “M pap Hod-like,” “M127a,” “M47b,” “M49,” “SL19.” Most of these date to the first two centuries BCE and came primarily from recesses in the floor of cave 4a. These excavated fragments remain the only sure means for identifying which manuscripts actually derived from the cave since 90% of the fragments came to the museum through Bedouin sources which cannot be confirmed beyond doubt. Of the 718 manuscripts presently ascribed to Cave 4Q approximately 578 are of defineable and of literary character. Of these: 143 (25%) are Biblical books, approximately 175 (30%) can be considered as Yahad/Sectarian, 28 Phylacteries/Mezuzot, approx. 110 (19%) parabiblical/legendary (including 9 Jubilees, 7 Enoch, 6 Giants, 2 New Jerusalem); 7 War Rule (M), 1 Temple Scroll; the remainder include calendars, liturgies, eschatological texts and private documents (About 140 others were poorly defined). 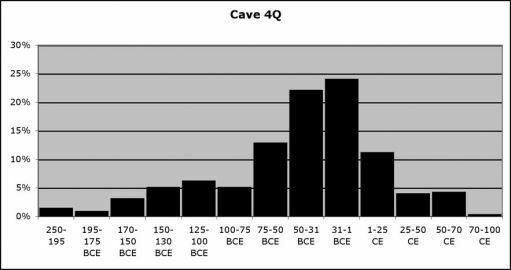 The corpus of manuscripts of Caves 4a and 4b is highly diverse in content and spans a broad range of time from the mid 3rd century BCE to the last half of first century CE. Although the Biblical and sectarian content of the cave, in many respects is similar to that of Cave 1Q, it also contains a large number of works which might seem atypical to be produced or propagated by such a group as the Yahad/Essenes. In many ways the collection is more of a general nature like that of a “National Library” representing an exhaustive collection of the national literature providing access to all pertinent literature, in all of its diversity, at a single location. Just the same, in spite of its diversity, the collection doesn’t treat the national literature produced by other groups of equal interest. It emphasizes the Bible and especially the Books of Moses as being of fundamental importance as all groups of the day did. Of similar value seems to have been the books of Jubilees, Enoch and Giants. However, it emphasizes the literature of one specific group (the Yahad) and noticeably lacking various compositions (including most of the Apocrypha and Pseusepigrapha, notably Ben Sira and I–IV Maccabees as well as works which might characterize Pharisaic and Saduceen teachings), which makes it more limited in scope. The tattered form of the scrolls from these caves, along with the fact that no effort seems to have been made to preserve them, either to store them in jars or in cloth seems to indicate that this was not an “in use” library, nor a hiding place nor an archive for usable scrolls. This collection is rather a “geniza” or burial place for sacred texts which were to be put away to deteriorate naturally and not to be disposed of as refuse. Excavation: Sept. 22-29, 1952. Final excavation report: de Vaux, DJD VI, pp. 3-22. Gr 4Q-1: inscribed jar. Gr 4Q-2 through 4: jars. Gr 4Q-5: jar lid. Gr 4Q-6: lid. Gr 4Q-7: jug. Gr 4Q-8: bowl. Gr 4Q-9: bowl. Gr 4Q-10: bowl. Gr 4Q-11 and 12: plates. Gr 4Q-13: cooking pot. Gr 4Q-14: jug. Gr 4Q-15: lid. Gr 4Q-16: jar. Gr 4Q-17: juglet. Gr 4Q-18: plate. Gr 4Q-19 through 21: bowls. Gr 4Q-22: lamp. Textiles. In summary, “Cave 4” (actually Caves 4a and 4b) should likely be considered the tattered remains of a mixed geniza, resembling the remains of a “National Library” or more correctly “Institutional Library” since it does not contain what would be considered objectionable or heretical materials (lacking many apocrypha, pseudepigrapha and non-Jewish philosophical works which might be considered objectionable). A partially collapsed cave discovered by the excavation team about 25 meters to the north of cave 4a during the excavation of cave 4. At least 25 manuscripts were recovered in the excavation carried out by J. T. Milik (PAM 41.033-037; 42.316-323). Excavation: Sept. 25-28, 1952. Final excavation report: de Vaux, DJD III, p. 26. Although the number of extant manuscripts in this cave is comparatively much smaller it may have served as a third, somewhat later repository within the 4Q geniza complex. It similarly includes relatively old manuscripts even though the copies of the scrolls are, in general, more recent. The cave similarly includes both Yahad (including a copy of the Community Rule) and lay Essene (including a copy of the Damascus Covenant) texts.